The Franklin County Board of Elections announced today that it was launching an independent examination into the election process used in last November’s presidential election. CLICK HERE TO REGISTER FOR THE CONFERENCE TODAY! Since November 3, 2004, there has been a groundswell of concern, and a plethora of evidence, that the conduct of the 2004 Presidential election in the United States was highly problematic. These concerns have been belittled by many and ignored by the corporate media in this country. However, the weight of the evidence is overwhelming that a multi-faceted strategy of voter intimidation and disenfranchisement, potential manipulation of electronically cast votes in many states, and other instances of election fraud and theft improperly influenced the will of the American people and may have subverted the "consent of the governed". This evidence was sufficient to have stimulated the Government Accountability Office and U.S. Representative John Conyers and other national leaders to investigate the evidence of wrong-doing. 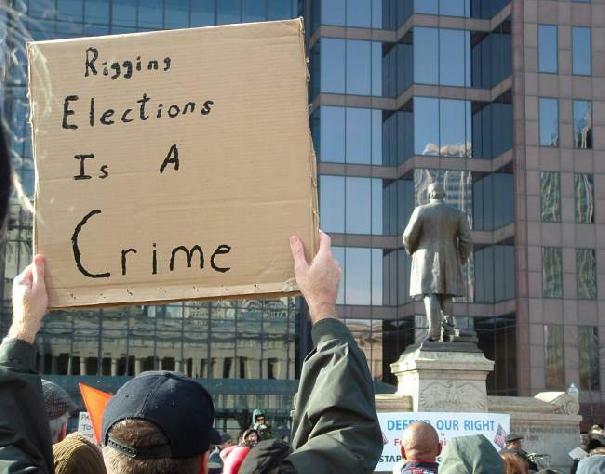 This evidence also caused the U.S. Congress to suspend their routine business and to debate the merits of accepting Ohio's electoral votes on January 6, 2005, a historic occasion that highlighted the many problems in Ohio and also served to shed light on similar problems in other states. With this Congressional debate, the American people's responsibility to win back our democratic process was enumerated and enjoined. To date, most of the discussion and information sharing on the problems with the 2004 election have occurred in the virtual world of the Internet. While there have been some local gatherings and regional and national protests focused on this issue, there has been no opportunity for concerned citizens, researchers, activists and elected officials to meet under one roof to review the wealth of evidence for the many threats to our democratic processes which the 2004 election revealed and to discuss the urgent need for election reform. While some panels on this topic have been added to several national meetings, these panels are not nearly sufficient to present all of the evidence for the 2004 election problems. It is also insufficient to fully inform the American people enough to motivate them to seek redress for the violations of our voting rights which occurred with this past election and to coalesce sentiment around an election reform agenda. For these reasons, this three day Gathering To Save Our Democracy - A National Conference will provide the appropriate forum for expanding public awareness, for congregating the accumulated knowledge under one roof and for providing a platform for mobilizing support for election reform and justice. Nashville, Tennessee is the setting of this conference. Nashville has a proud history of early successes in the 1960s civil rights movement, we are in a Southern and supposedly "red" state (we prefer to consider ourselves an Orange State, in deference to the Ukrainian example), we are centrally located within a day's drive of 60% of the U.S. population, we have an international airport serviced by a dozen major airlines, and we have several locations tentatively identified as appropriate and historic venues for hosting the conference. But most importantly, we have an energetic (and growing) band of citizen-activists for election reform in Tennessee who would insure the successful implementation of this conference. This conference will be a comprehensive and historic event that will bring together the "major players" who have surfaced in the dialogue over the problems with the 2004 election and the need for election reform. We also anticipate that the conference will be a gathering place for the many concerned citizens throughout the nation and the world who are intent on preserving democracies. We hope that this conference will help break the media silence about the problems with the 2004 election within our country and provide a forum for increasing the world's attention to our threatened democratic principles. In addition, we will hold discussion sessions before and after the conference to exchange ideas and build coalitions to pursue the necessary elements of election reform and to redress our concerns with the 2004 election. The conference registration fee is $30 (with exceptions for hardships), and will cover all conference-related activities. Please review the tentative conference agenda, complete the conference registration form and register using PayPal. (People who cannot attend the conference but who would like to support the conference by making a donation can do so using PayPal also.) We will send you the final conference agenda and other details one week prior to the conference. Please contact Bernard Ellis, Jr., MA, MPH (931/682-2864; tracevu@bellsouth.net ) for more information on the conference. Thank you for supporting the conference and for promoting the preservation of democracy in America. Registered Franklin County Voters Whose Provisional Ballots Were Rejected on the Ground that they were "not registered"
=EIRMapState&state=Ohio&cat=ALL&tab=ALL, or the hotlines operated by Common Cause, the AFL CIO, NAACP, and others, whose databases are not yet publicly available. Secretary of State J. Kenneth Blackwell has asked the Columbus federal court to dismiss, or to transfer venue, in the recount case, and has expressed opposition to the court's conducting a hearing unless he can take the depositions of John Kerry and John Edwards.